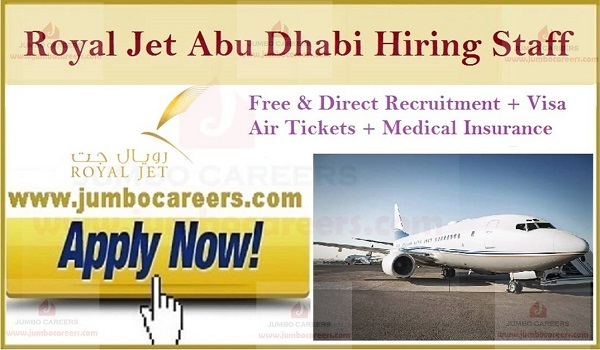 United Arab Emirates luxury chartered flight operator Royal Jet hiring Direct staff for Au Dhabi- UAE head Quarters. Its a direct and free recruitment by the company with Free visa, air tickets and medical insurance. About Royal Jet Abu Dhabi UAE: Royal Jet is an award-winning international luxury flight services provider headquartered in Abu Dhabi, the capital of the United Arab Emirates (UAE). It is jointly owned by Abu Dhabi Aviation and the Presidential Flight Authority or PFA, the royal flight service.